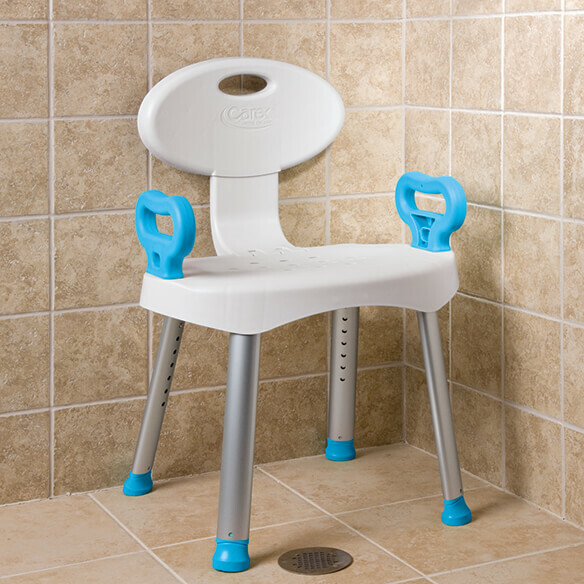 Sturdy 17"W bath and shower seat with arms has removable handles that ease standing and sitting in the shower or bath. Supports up to 300 lbs. Bath seat's height adjusts from 16 1/2" to 22 1/2". Non-slip feet. Weighs 9.6 lbs. we have tried four different shower seats and had problems with all of them. My wife is in a wheel chair and needs help getting into the shower and all the other seats we have tried were very unstable. This seat works great in getting her into the shower and out also. This chair is great I take care of my 91 year old mom and this chair make her feel more stable getting in and out of the tub when I give her a shower because of the handles and the adjustable legs. Thanks for making mom s little less nervous. This was a wonderful purchase, wish I had found this months ago. I help my 90 year old Mother take a shower, I usually ended up with more of the water than she did, now with this stool I can get her completely washed and I only get a small amount of water. So very happy with this purchase - highly recommend it. Thoroughly upset with Easy Comforts. Charged me shipping when anything over $39 should be shipped free. I sent ad copy of the free shipping deal and I am still waiting for a response. armrests are majority for safety. I like the hand holds just wish that it also swiveled but you can't have it all. Handles/arm to assist with standing and the back support. Higher than most bath seats. Both my husband and I need it to take a shower. Recommended by health care professional. I just bought one but didn't have adjustable legs. I had to have this one. Just what I desperately need. Thank you. Because the arms are removable. To aid my 90 year old Mother in taking a shower. To better assist my 91 year old mom in the shower. I chose this item because it fitted exactly the needs of my son. This item is very useful for me in the shower. Appears to be well built. Has arms for assisting in rising from a sitting position. FOR MY SON,DIABETIC &HAS AFFECTED HIS FEET & LEGS. My husband feels that he needs the safety od a shower seat. I have looked at several and this looks as though it will be the best item for his use. This item seeme to be very user friedly. I chose this because it has handles on it. I like the height that it goes to, as well as a back and arms. For safety in the shower. what are the entire dimensions? BEST ANSWER: Thank you for your question. 30” inches at lowest setting up to 35½” at the highest setting. There are a total of 7 height settings on the legs. We hope this information will be of help to you. BEST ANSWER: No, it doesn’t have a soft cushion. Does bath and Shower seat have holes in seat? BEST ANSWER: Yes. It has holes in the seat for drainage. But like all plastic seats, the seat is cold when you first sit on it. I put a towel on the seat for my mother so it isn’t a shock when she first sits down. Yes, it does. Well constructed & sturdy. where can i get replacement tips for this chair? BEST ANSWER: I really have no idea. Try the big box stores or medical supplies. I should think that cane tips might work. Sorry I couldn't be of any more help. I have checked several medical stores. They don't have them. How many inches long is the seat that you actually sit on? BEST ANSWER: Thank you for your question. The seat measures 11” front to back x 20” side to side. We hope this information will be of help to you. BEST ANSWER: Thank you for your question. It is 11 inches between the legs in front and 10 1/2 inches between the legs in back. It is 20 inches wide on the outside of the legs. We hope this information will be of help to you. BEST ANSWER: Thank you for your question. The width of this item is 20” width on the outside of the legs. We hope this information will be of help to you.